The stories are far from all negative. John with his dad. Rest in peace, J.P. Sr. 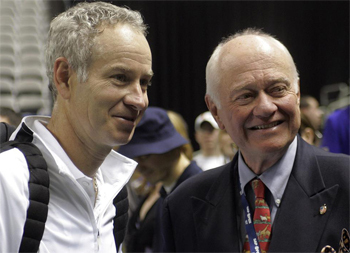 Recently I had the chance to read a new book called "Facing McEnroe," by tennis writer Scoop Malinowski. It's a compilation of remembrances and stories about John from people from all parts of the game—players, coaches, reporters, celebrities, fans. It's the lastest book in a series Scoop has written including "Facing Federer," "Facing Nadal," and "Facing Hewitt." Anyone who has had the experience of dealing with elite tennis players - or celebrities in any field - knows that they are just like everyone else in having multiple sides to their personalities. You might have a random encounter and decide someone with a "name" is a complete, narcissistic jerk, or that they are a down to earth human being as real as you or me, or somewhere in between, or both. Certainly that is the case with John. Take two of my best friends who also work on Tennisplayer. They will remain nameless. One adores John and modeled his game (and I will say, in part, his on court personality) on him. The other absolutely cannot stand the mention of his name. Mark "Scoop" Malinowski is a widely published tennis writer who has written for Tennis and the ATPWorld Tour, among many others. He has authored 4 other tennis books as well as books on Mohammad Ali and Mike Tyson. All are available on Amazon. There are a lot more stories in Scoop's book.